If you have an iPod mini you need an iTrip mini. The iTrip mini FM transmitter lets you play your iPod mini’s music wirelessly through any FM radio - in your car, on the road, even at home through your stereo. 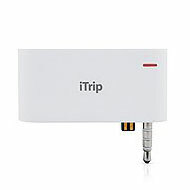 The iTrip mini was designed exclusively for the iPod mini. 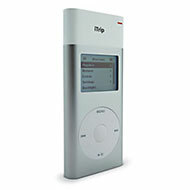 Its form factor matches perfectly all the curves and lines of the iPod mini. The iTrip mini gives you the best possible performance because you can choose any empty station from 87.7 to 107.9. 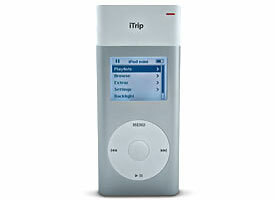 Best of all you choose and change your iTrip mini stations directly from the iPod mini itself. The iTrip mini does NOT need batteries. It receives a tiny amount of power directly from the iPod mini - saving you from wasting hundreds of batteries a year. That’s good news for the planet and even better news for your wallet. 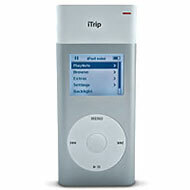 The iTrip mini can even be used while charging your iPod mini in your car or while docked. If you add an iPod car charger, you can listen to your iPod mini while road tripping all the way across America. Now that’s cool! iTrip mini doesn’t have a power switch - it doesn't need one. Just plug it in and go. It shuts off automatically after 60 seconds of silence just like the iPod mini. You see, we designed the iTrip mini to be the ultimate iPod mini accessory because it lets you share the music and share the fun. Forget the headphones. Get an iTrip mini and go wireless!